How do I get Solar Panels? That’s where Fleming Construction comes in! Right now is a great time to consider solar energy. Solar cells work by converting sunlight into electrical energy. An energy efficient home is something we should all strive for. These tips can save you money! One of the oldest forms of construction, Design Build brings the entire process of construction under one roof. 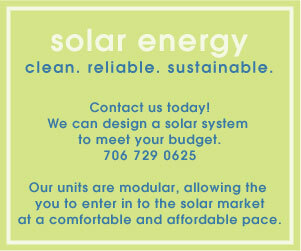 Visit one of our solar powered homes in Augusta, Georgia. Questions? Comments? We’d love to talk to you. A photovoltaic system, or solar electric system provides 100% clean electricity from the sun. Photo means produced by light and voltaic means electricity produced from a chemical reaction. A photovoltaic system lets you harness the power of the sun simply using five or six major parts and gives you the freedom of being your own power company. Systems are most commonly comprised of four major components: PV panels, a charge controller, batteries and an inverter.